As you set up and refine your recruitment listings and look for candidates to fill your openings, here are some tips and strategies for you to consider. Utilize the concept of "A Better You. 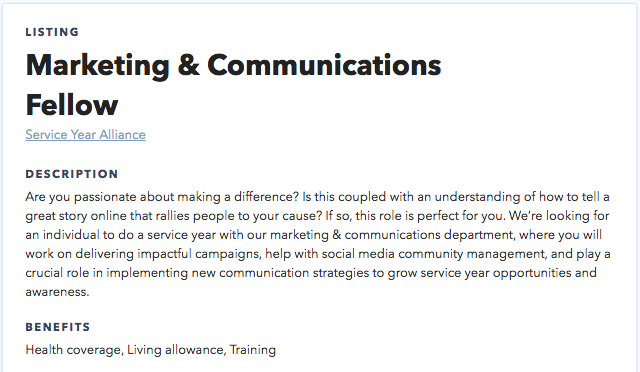 A Greater Us:" Write a listing description that speaks directly to candidates by including information on the community impact they can make, and also speaks to the personal/professional growth they will experience as a service year corps member. Communicate to candidates by using "you" instead of writing about the listing in the third person. Have a concise listing description: Keep your description to 1-2 paragraphs, so that potential candidates can quickly learn about the role and if it might be a good fit for them. Don't feel the need to include pieces of information that appear in other parts of your listing (e.g. living allowance, hours per week, application window, etc.). Use a practical name for the listing: All listings are searchable by name. In most cases, using a simple position name (e.g. "Literacy Tutor") is a good way to help your listing be found if a prospective candidate is doing a keyword search. Names also help a candidate quickly learn about the role if they find your opportunity as a suggested match. Make it clear how to apply: Make sure to include "Next Steps" in your application process when completing your listing. Set a target application deadline, and update it if needed: We frequently feature listings that are closing soon, and this is a good way to help drive extra traffic to your application as your targeted closing date approaches. If needed, you can always extend the application deadline past your target date if you are still looking for candidates to fill your openings. Generally speaking, it's not a good idea to have your recruitment window extend more than a month past your position start date (which can make your listing look out of date); in instances where you're still recruiting more than a month out, make sure to also adjust your position start date accordingly. Publish listings for your next cycle early: If you have an idea of when you'll be beginning your next recruitment cycle, you can update your listing to include future application dates and start/end dates. This will allow your listing to be featured in our "Coming Soon" section, and will also allow candidates who are looking for opportunities at a later date to be aware of your future openings. While candidates will be able to “save” your future listings, they'll only be able to apply once it’s within the recruitment window. Message and call applicants: You'll receive information in your dashboard on candidates who apply to your listing, and if you've shared a link to any additional application requirements, the applicant will also have access to that. You can message candidates to follow up and thank them for applying, share more info about your program, and encourage them to take any additional steps necessary to complete an application with your program. If a candidate has provided a phone number, you can also call them to further personalize your outreach. Be proactive and search for leads: ServiceYear.org is a two-sided platform, meaning that just as candidates can search for your opportunities, you can search for candidates! You can filter this search based on where potential candidates are looking to serve, what they're interested in, education level, and who's joined most recently. Click into a candidate card to learn more information, and recommend your listing to individuals that you hope to have apply for your opportunity. We've also added a beta "Find Candidates" feature in your dashboard that you can try out to discover individuals who might be a good fit to recommend your listings to. Keep your dashboard up to date: If you are no longer actively considering a candidate, you can click "Decline" to remove them from your dashboard. If you have accepted a candidate to serve in your program, you can enroll them, which will also allow Service Year Alliance to communicate with them about being part of the broader service year movement, as well as any supports that we have available to offer them. Add notes to track communications: When you click directly on a candidate card, you have the option to add internal notes, to help keep track of any follow up communication. You can also use this to leave notes for other members of your team. Recruitment Toolkit: Check out our complete Recruitment Toolkit. This includes additional tips and best practices, including social media strategies. "For One Year: My Office" Campaign: Along with the general social media strategies in our recruitment toolkit, learn how your organization can join our "For One Year: My Office" campaign to highlight how service years look at your organization. Send suggestions and ideas to our team: We are constantly looking to improve and add new features to ServiceYear.org. Start a chat any time to send us your feedback and ideas.